What’s a guy to do when faced with an abundance of garden tomatoes? Eat them all at once? Make a ton of tomato soup? Let them go bad while I decide? I wasn’t really feeling any of those options, so I decided roasting was the way to go. 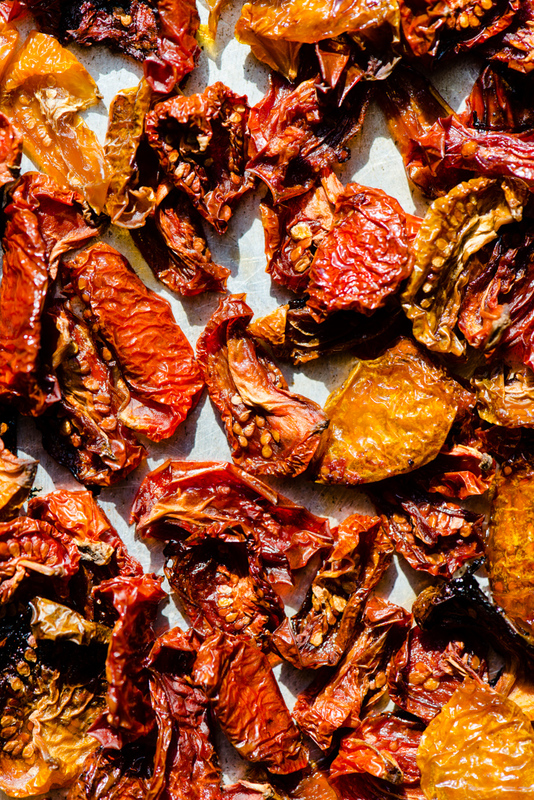 If you’ve never slowly roasted fresh tomatoes, you are in for a treat! Garden tomatoes are amazing as is, but when you slowly roast them their flavour intensifies in the most amazing way. 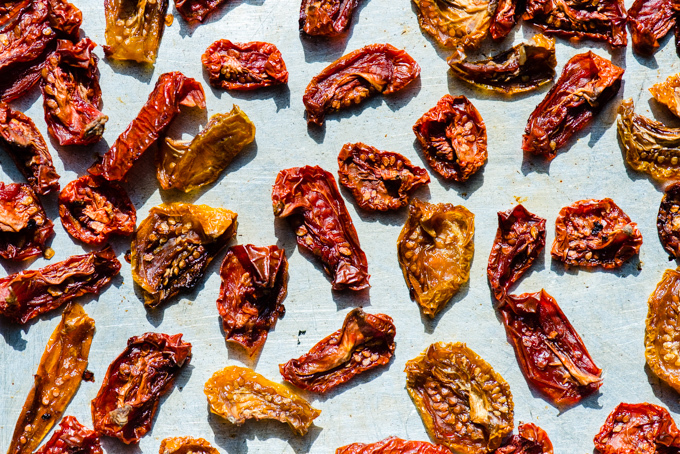 They become slightly sweeter, with plenty of that acidic tomato-ey zip we all love, making a perfect addition to salads, baking, waffles, or just eating them like candy (because that’s pretty much how amazing they become!). It’s one of the easier ways to deal with those end of season tomatoes, stretching their shelf life by several weeks, so chop those tomatoes, pop them in the oven, and try to stay busy for a while! One of our favourite ways to use up garden tomatoes. 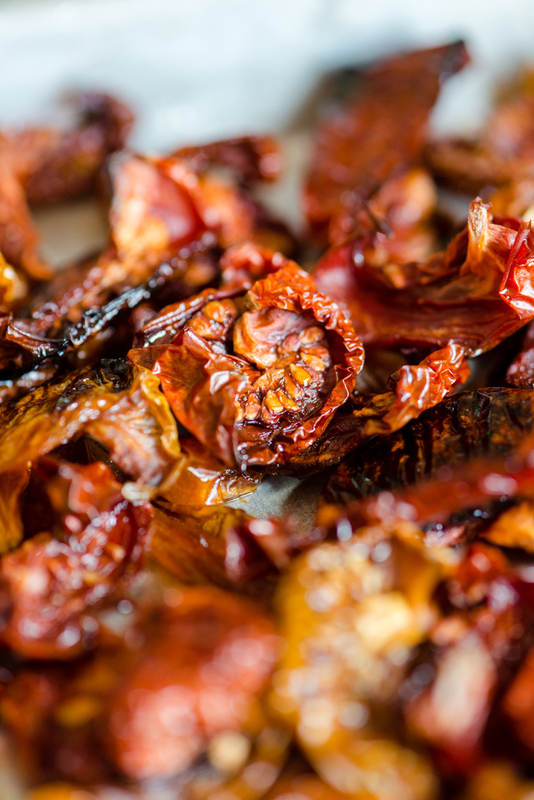 Slowly roasting intensifies the flavour, making these tomatoes perfect for salads, baking, or just snacking on! Chop tomatoes into evenly sized pieces (I cut larger tomatoes into eighths, and smaller tomatoes into quarters - this ensures they roast at about the same speed). Drizzle them with olive oil, and sprinkle with salt (to taste). Pop them in the oven, and let them roast for 5-8 hours depending on the size of your tomatoes, removing any tomatoes that are roasting quicker than others, so they don't get burnt. Once they are roasted, let them cool on a rack, or some paper towel, then store in the fridge in an airtight container, or pack them in a jar and fill with olive oil and refrigerate.